Last weekend was Thanksgiving (even in Switzerland when you have American colleagues) and I was invited to a wonderful Oklahoma-style Thanksgiving dinner, which included turkey, (amazing) corn bread, mashed potatoes, cranberry sauce, gravy, and many many other delicacies. Scott also made pumpkin pies and pecan pies so I brought an apple pie. 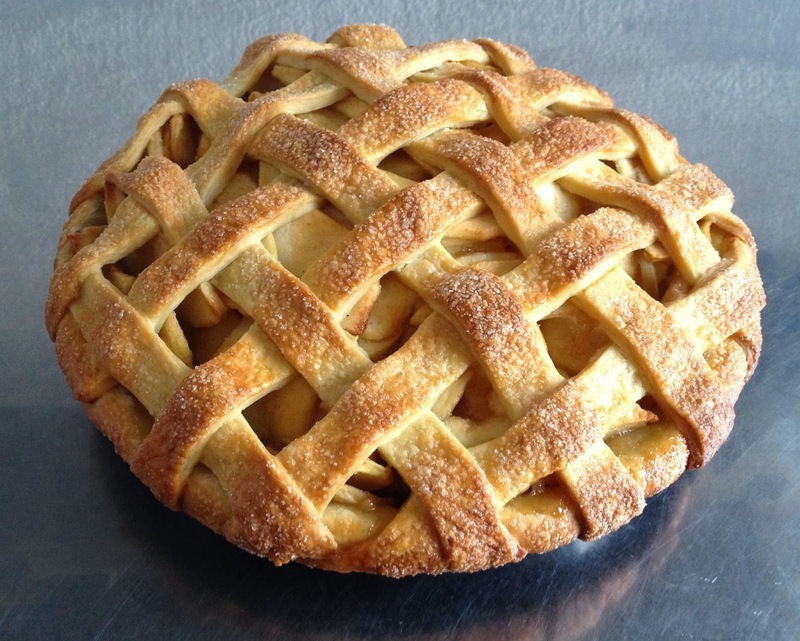 I had never made an American-style apple pie so that required some researching and thinking: which apples, which filling, and most (esthetically) important full cover or lattice top? 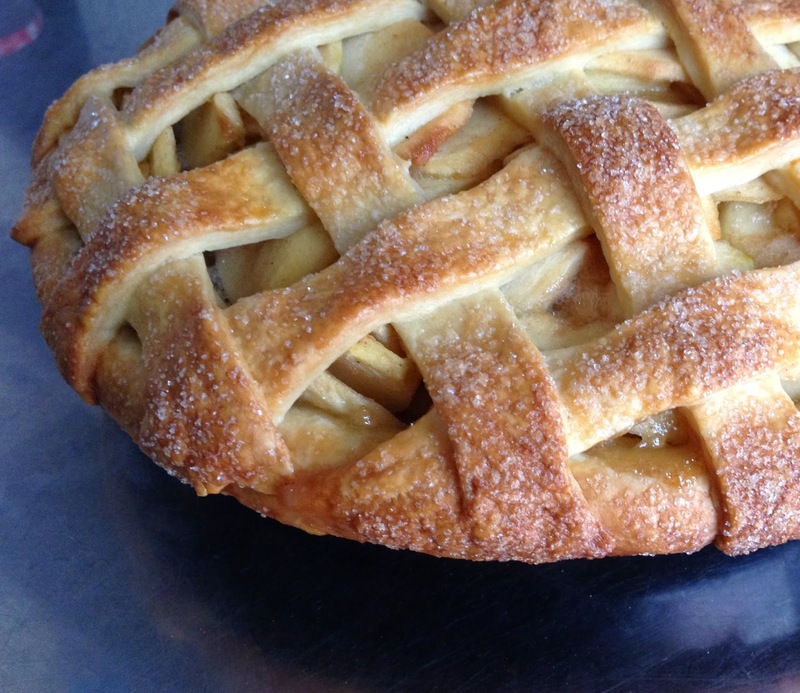 I find Golden apples bake well and have a great taste and texture in cakes. 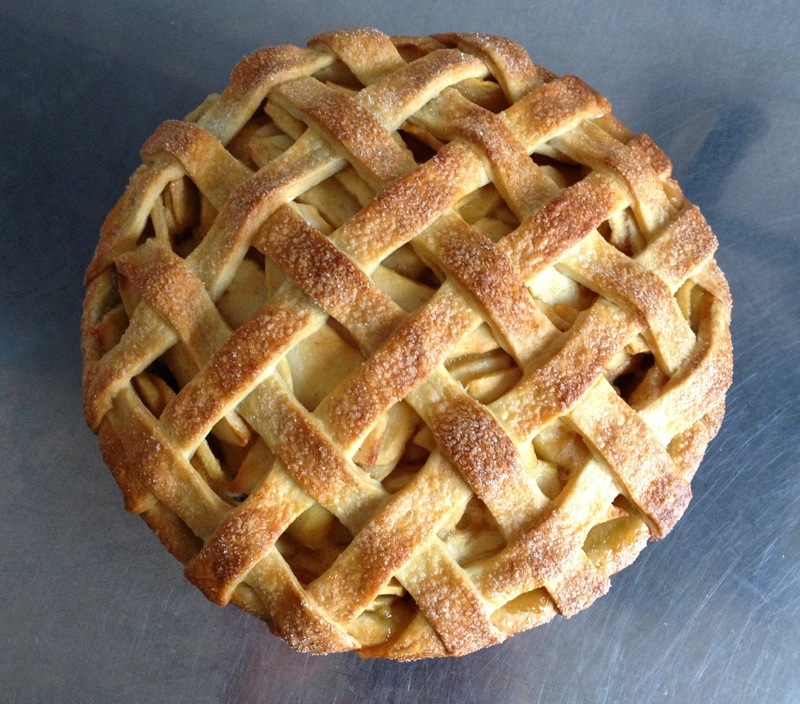 For the filling, I went for a classical sugar-butter-flour filling with cinnamon, butter and a touch of nutmeg. 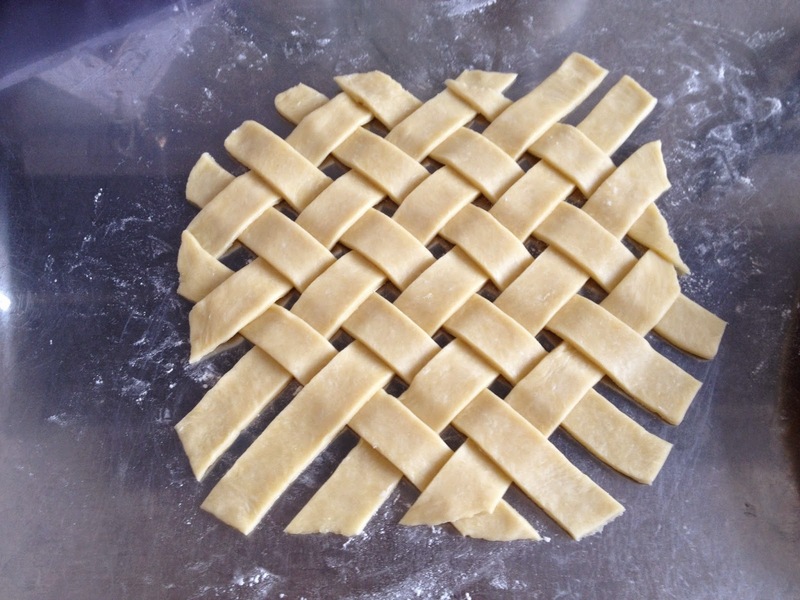 Finally, I chose to do a lattice-top pie because it looks so much better, but is also more work, so you can skip that step if you'd like. 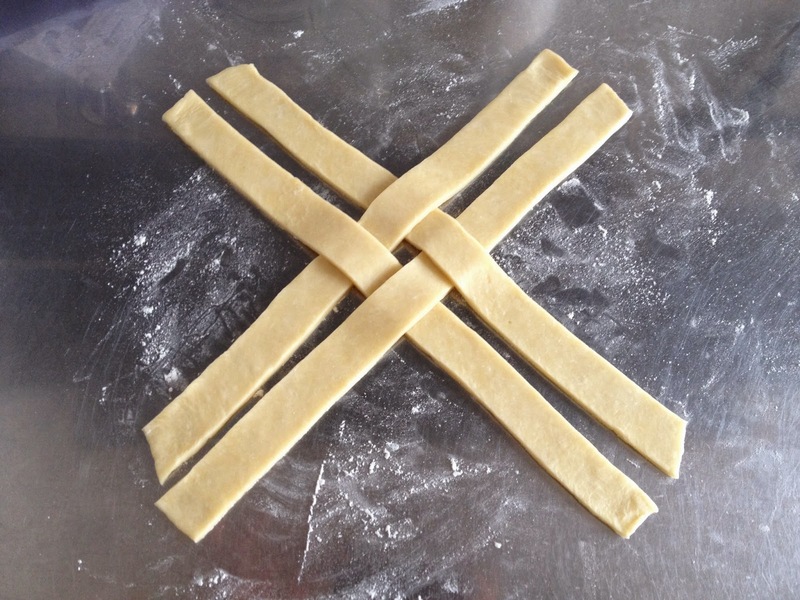 First prepare the dough (you can prepare it the day before if you want to save time the day of baking). 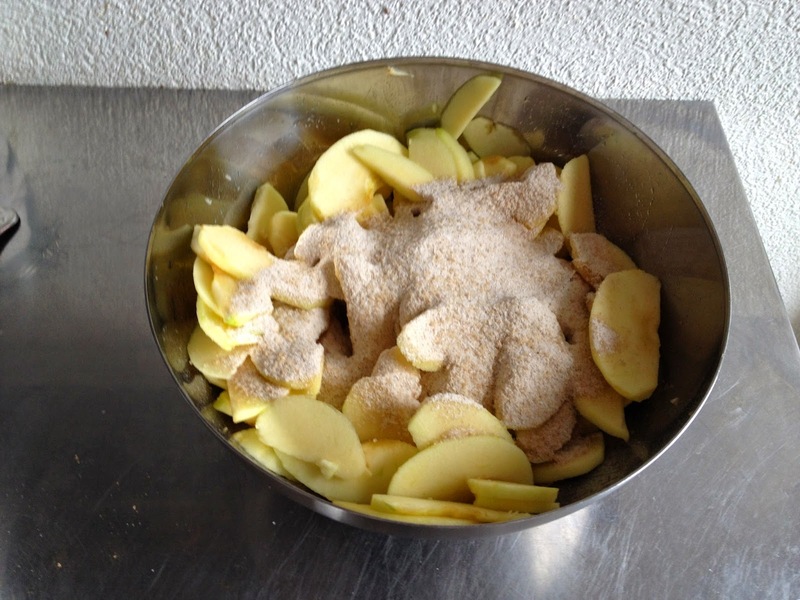 Mix flour, salt and sugar in a bowl. Cut up butter in chunks and add to flour. Mix with your hands to make crumbs. 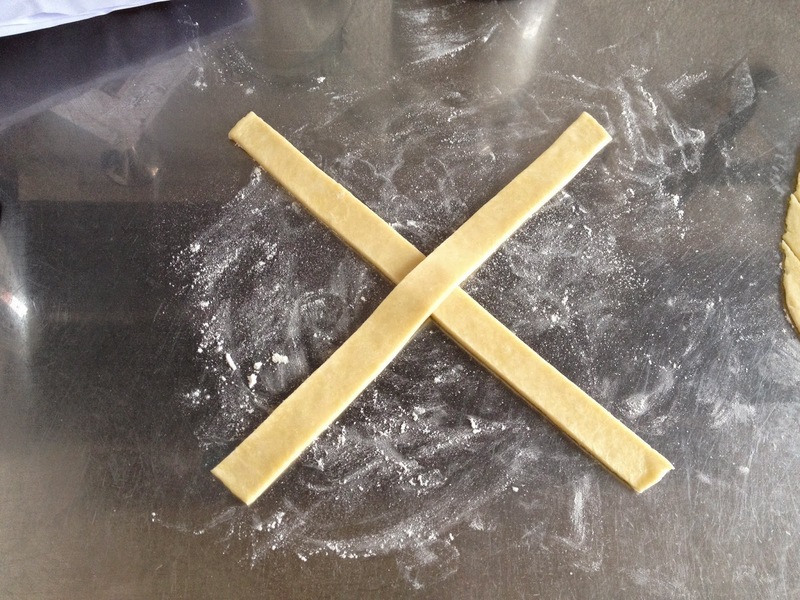 Add water and mix fast with a wooden spoon into a dough. 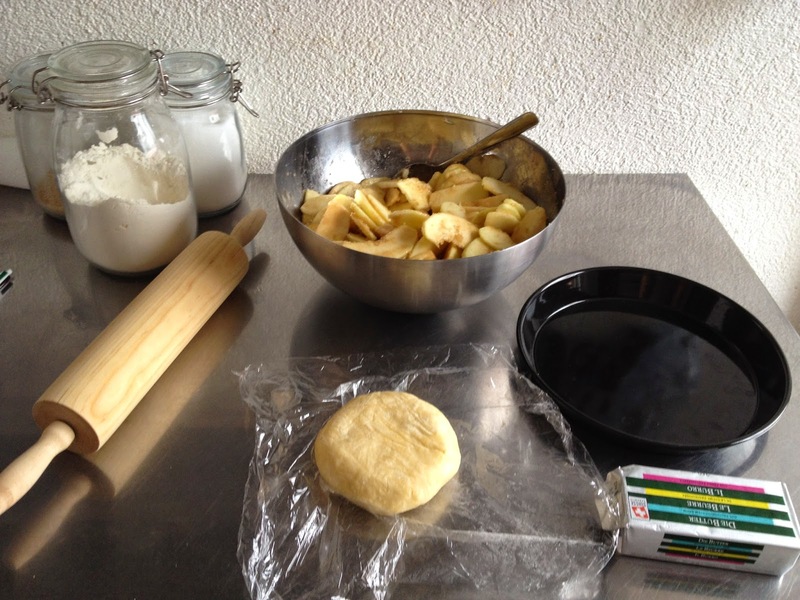 Divide the dough into 2 flat disks, wrap in plastic film and refrigerate 2 hours. 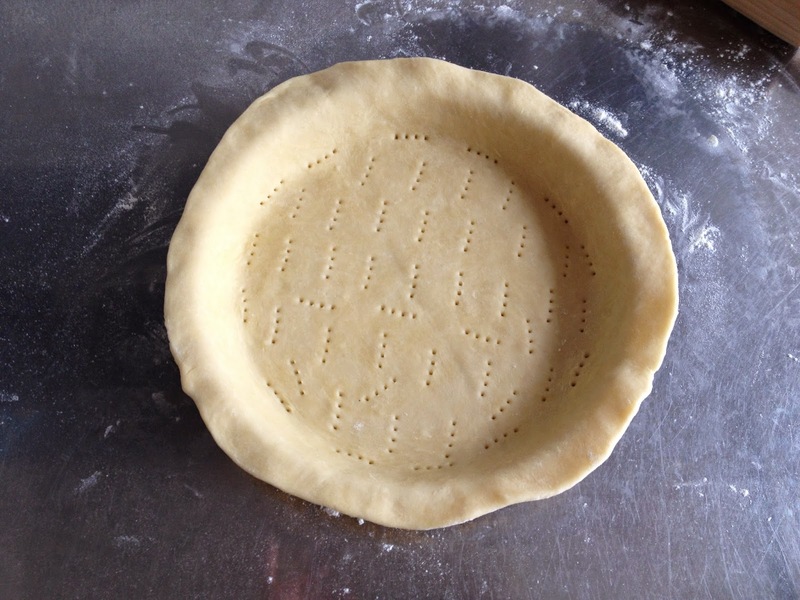 I had about 660 g dough and made a 340 g disk for the bottom and a 320 g disk for the top of the pie. 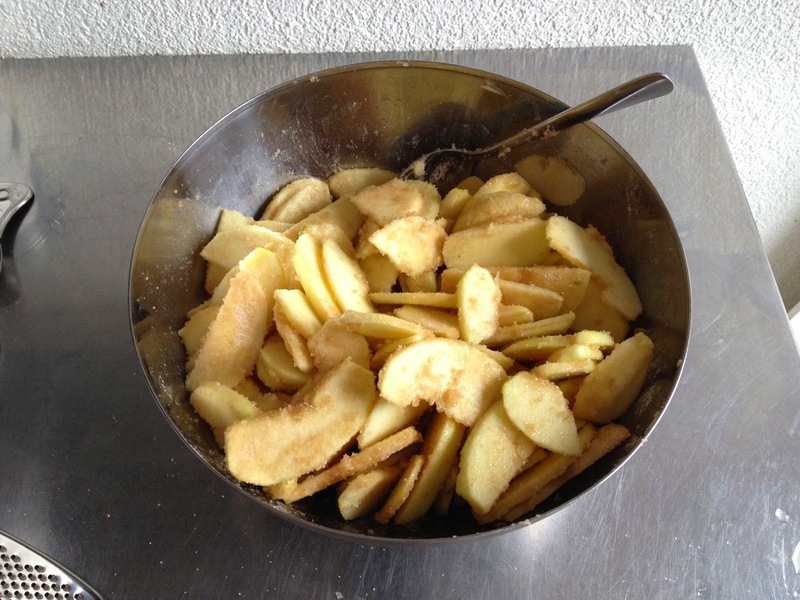 Prepare your apples: peel, core, and slice them thinly (approx. 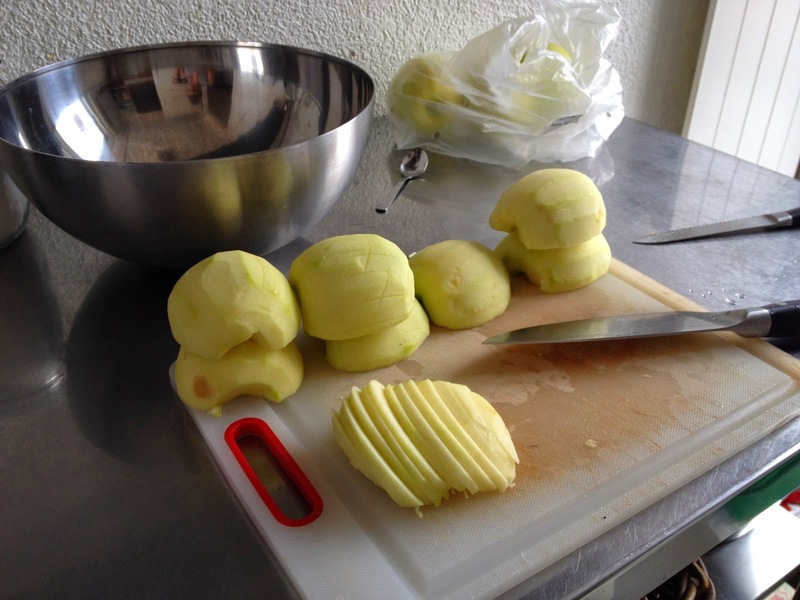 1.4-1.5 kg of prepared apples). Add lemon juice and toss in a bowl. 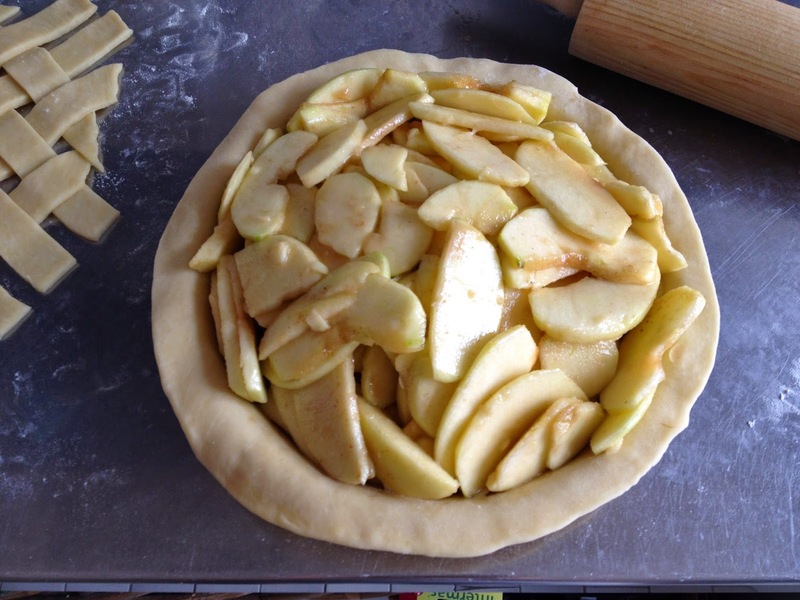 Mix filling ingredients and add to apples, toss making sure every slice is coated with the filling. 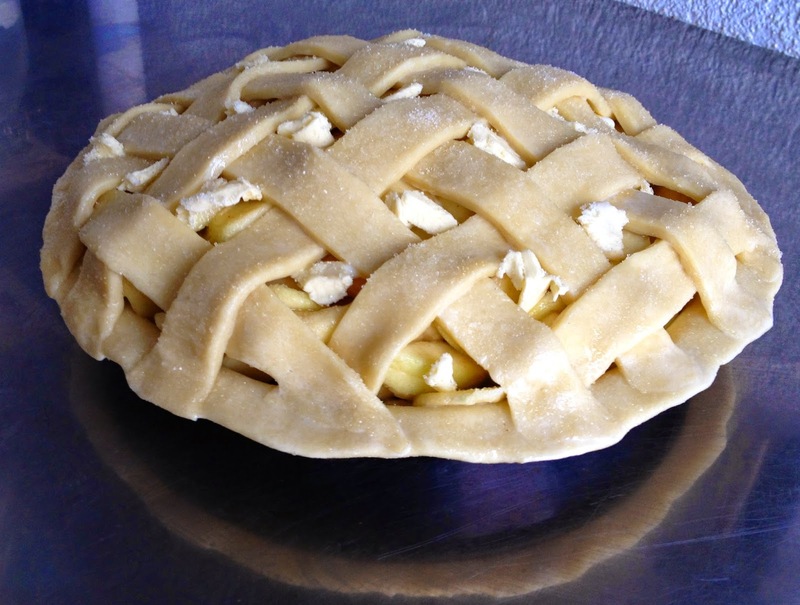 Set aside for 30 min or so (some juice will come out allowing you to pack more apples in your pie). 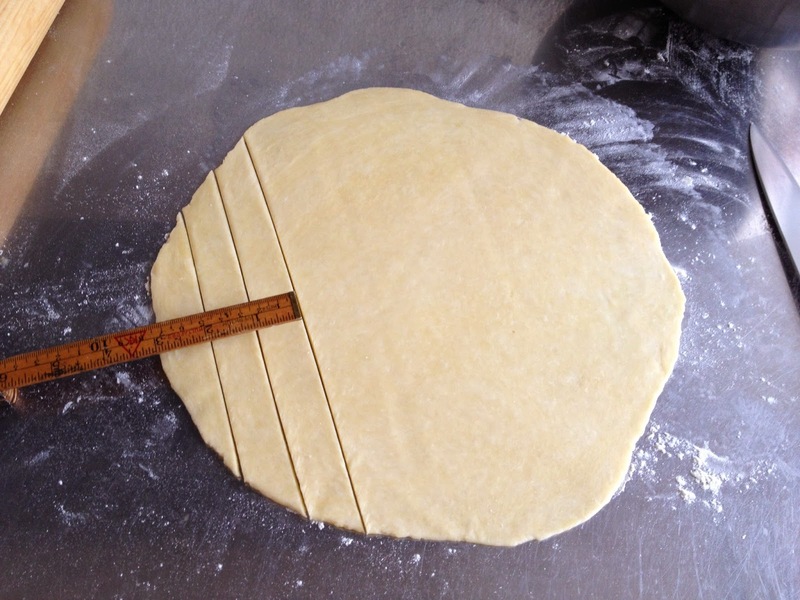 Take out the bigger dough disk and roll it out on a floured table to a 3-4mm thick and wider-than-your-form disk: you have 1-2 cm dough extra from the edge of the pie form. 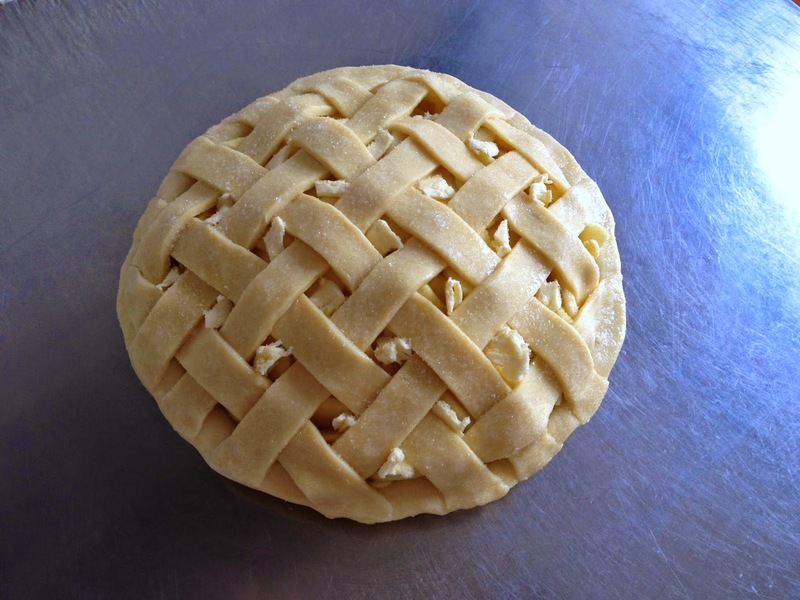 Transfer the dough to a buttered and floured pie form, prick it, and refrigerate while preparing the next steps (I put it in the freezer at -4 C to make sure the dough doesn't shrink but I wouldn't do it if you have a colder freezer). 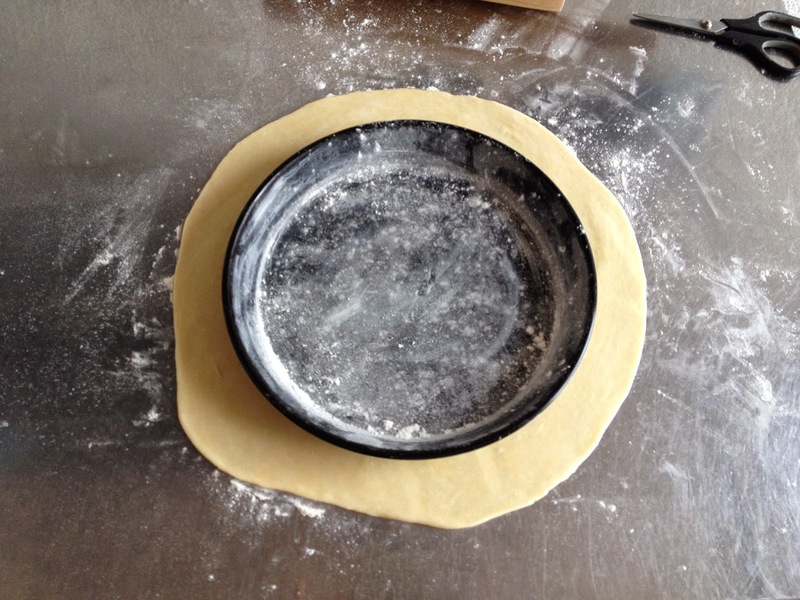 Roll out the 2nd dough ball to a disk (again bigger than your pie form) on your floured table. 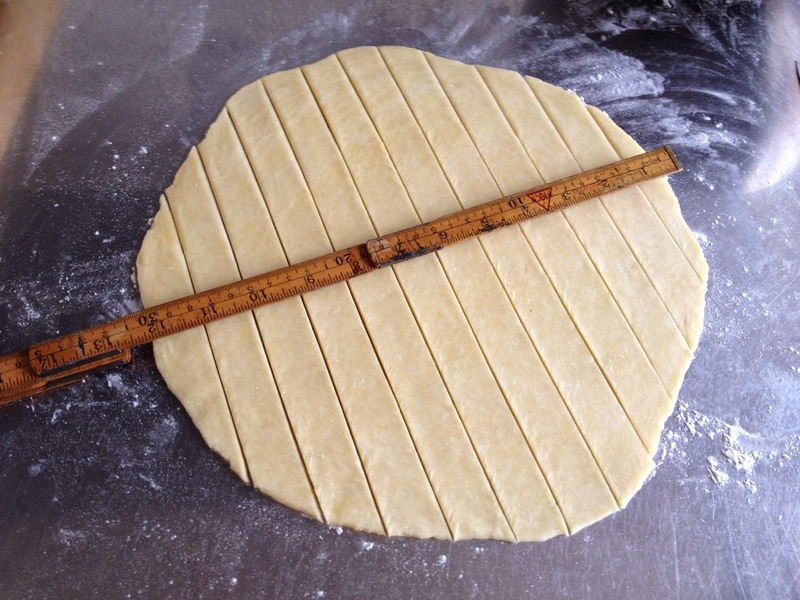 Slice it into 12 2.5cm-wide stripes. 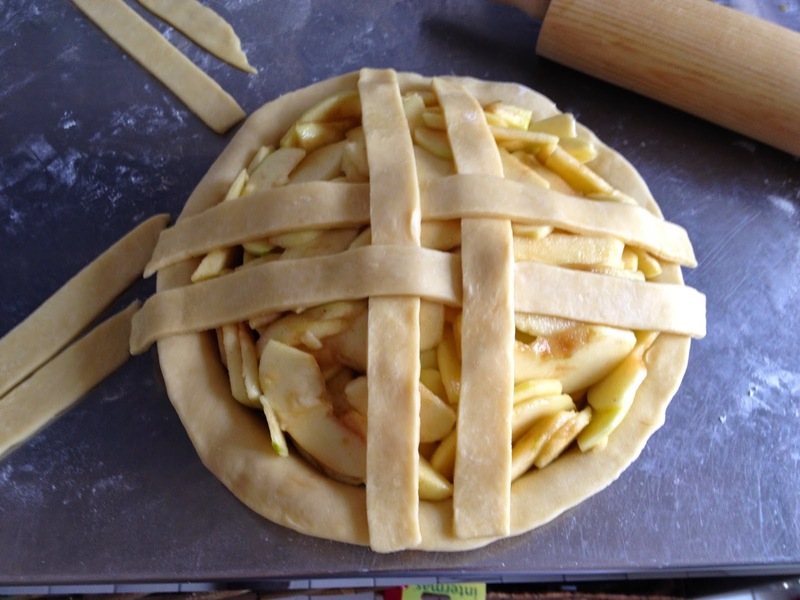 Fill your pie form with your apple mix (don't transfer the juice), pack your apples tightly and form a dome (apples will shrink while baking). Sprinkle the apples with some butter. 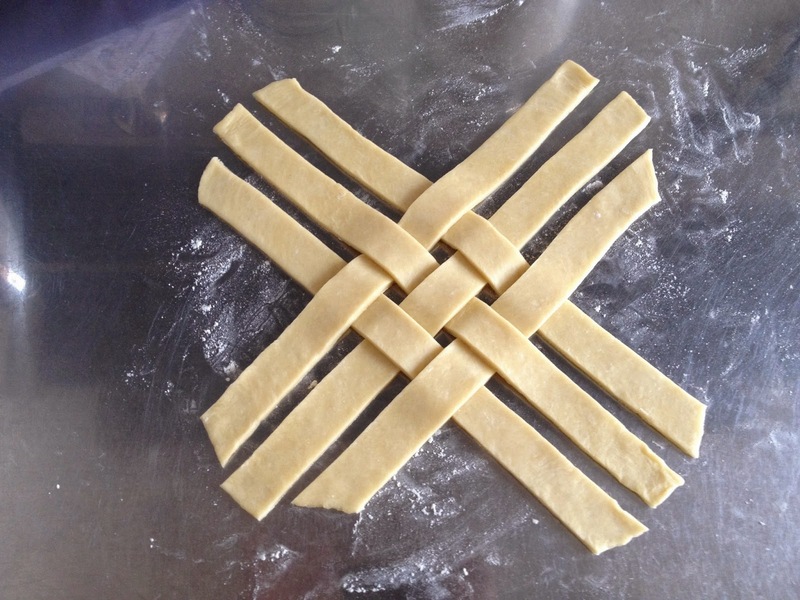 Transfer your dough stripes to the apple pie making a lattice (place your stripes 2cm appart). 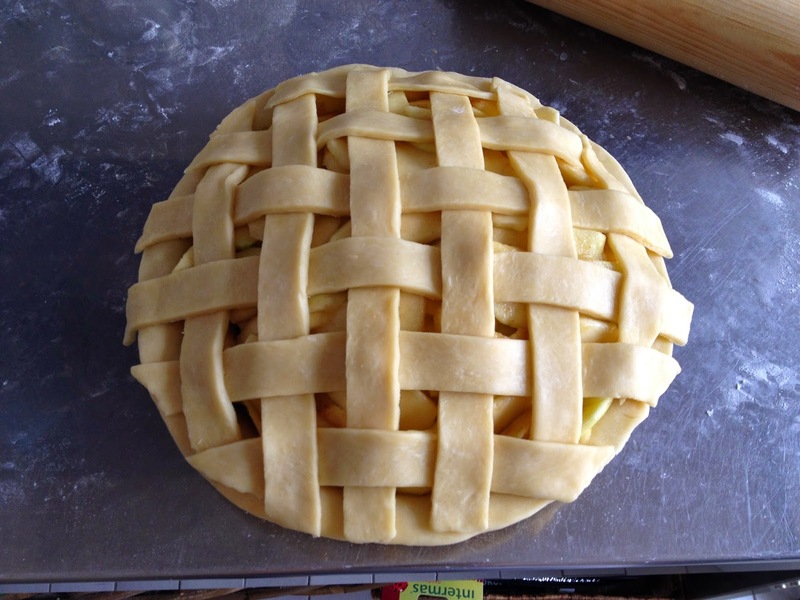 Trim the extra length of the stripes and connect the stripes to the edges of the pie. Paint the stripes with milk and sprinkle sugar on the stripes (you can be generous here). 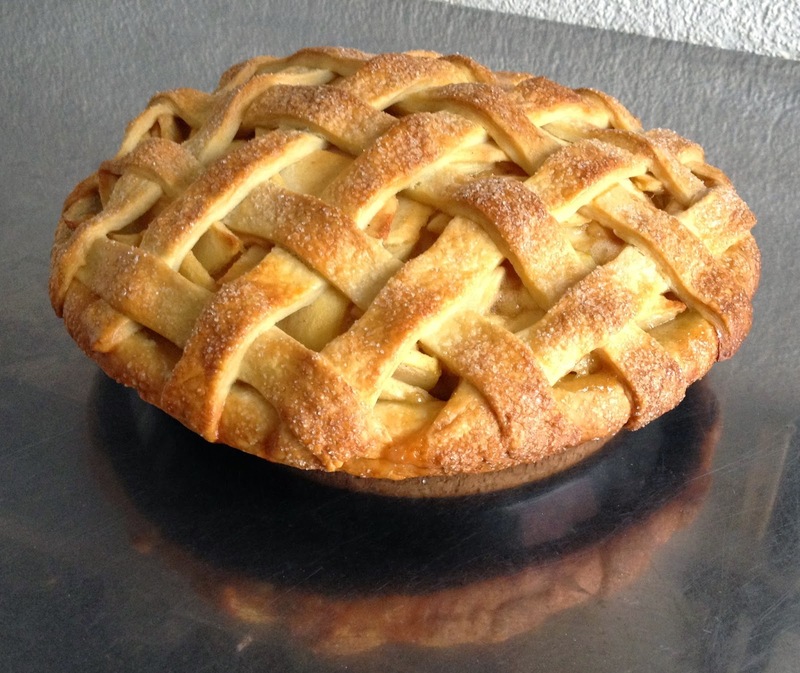 Bake the pie 10 min at 210 C, then another 1hr10 at 175 C (until golden and apples are soft). Serve lukewarm with some vanilla ice-cream.